Unlike fishing regulations, etiquettes in recreational fishing are not rules that you are required to follow, however they are general guidelines that you are recommended to follow so that you and other users can have a positive fishing experience. Different etiquettes apply to different situations, but the objective generally remains the same - To ensure that your actions do not affect other users and maintain the quality of the fishery. Giving other users, especially those who are at the waters before you, enough space is also your priority. In the ocean, trolling too close to other boats may result in tangles when fighting a fish, particularly chinook salmon. In lakes, it is important not to move your boat across the sections where other anglers are fishing. 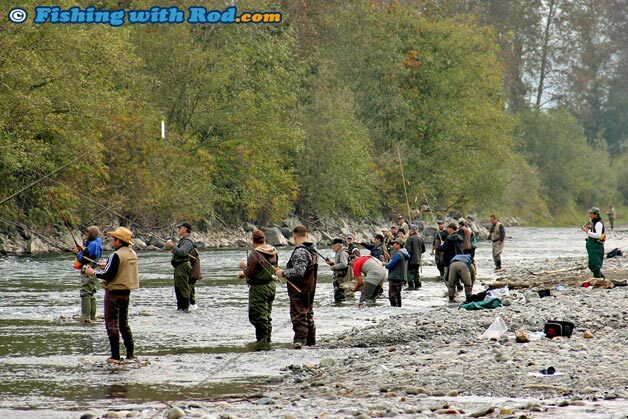 In rivers, because anglers typically focus on fishing the section downstream from them, it is important not to walk into a spot directly downstream from other anglers. Because most fisheries in British Columbia are public and only require a general fishing licence to use, it is on a first come first serve basis and not limited to a finite number of users. It is important to share without creating potential conflicts. If you are arriving at a spot where it is occupied by other anglers, then either ask if you could use the same spot or proceed to another area. British Columbia has a vast amount of fishing waters, so finding a spot where it is unoccupied is often not a challenge. When sharing the same piece of water, how you fish may also affect other users. Always watch your surroundings before you cast so potential hook injuries can be avoided. Be aware of where other anglers' fishing lines are so you do not cast over them. When another angler is fighting a big fish, be sure to keep your fishing line out of the water so tangles and fish loss can be avoided. Fishing etiquettes do not just stop at respecting other users. Respect should also be given to the environment and the fish that you intend to catch. Keeping your fishing spots garbage free after using them allow other users to have the same positive experience that you have. Fishing lines should never be discarded at the waters because they do not biodegrade and wildlife may entangle in them and die. When catching and releasing a fish, it should be done with great care. An unwanted fish should never be left on land to die. By practicing responsibly, we can maintain the high standard of British Columbia's fisheries. Although there seem to be many etiquettes that anglers should know, you should not be too worried as long as you have a positive attitude when heading out. For more information, the Sportfishing Advisory Board has developed a set of code of conduct that anglers may use to follow. Respect the space of others, leave enough room for everyone to fish.